I have located a number of 'Americana' related sites that some visitors might enjoy. The sites linked below all focus on one or another topic which would fall into the more broad category of Americana. As more ideas come to me, I will search the Net for other branches of the Americana tree. If you have found similar sites or un-represented topics that might fit into this category, find an e-mail link and send me your suggestions. I am especially looking for other topic areas to include here, so please help me out with your suggestions. The majority of the pages listed contain their own link pages which will direct you to many other related sites. With that in mind, I will only select a few from each category to showcase here. Legendary Lighthousesand Lighthouse Depot give insight into these beautiful and powerful towers of light. Lighthouses of the Great Lakes provides stunning images of the lighthouses in the Great Lakes region, including the Marblehead Lighthouse near Sandusky, Ohio. New England Lighthouses: A Virtual Guidegives an online tour of New England's beautiful and historic lighthouses. The Marblehead Lighthouse is just a short drive away from my home in Sandusky, Ohio. The Barn Journalis dedicated to the appreciation and preservation of traditional farm architecture. Barns of Jefferson County (WA) also displays images and information relating to historic barn structures. The Wisconsin Barn Preservation Program is aimed at addressing public concerns and drawing attention to the importance of preserving the elements of Wisconsin's rural countryside. 2003 marked the Ohio Bicentennial. To celebrate this occasion, the Ohio Bicentennial Commission hired Scott Hagan to paint the Bicenennial logo on one barn in each of Ohio's 88 counties. The project took about five years to complete. Read all about it on the Bicentennial Barn page, with links to photos of each barn. I received this story in an e-mail from a friend in February of 2006. I do not know where it originated; therefore, I cannot give credit to the source of the story or the photographs, but both were too beautiful not to share. Clara's Railroad Crossing explores some of the history and lore of the locomotive. Visit North American Steam Locomotives for a wealth of information and links. The goal of the Wisconsin Historic Rail Connection is to provide a unique look at railroading & some of the people who have helped make rail transportation possible. The Mad River & NKP Railroad Museum is located in Bellevue, Ohio; just southwest of Sandusky. The Covered Bridges site is interested in the conservation of the heritage and rural scenery which these bridges provide. Ohio Covered Bridges deals strictly with the bridges located in my home State. Parke County, Indiana claims to be the Covered Bridge Capital of the World. They even have an annual covered bridge festival! Speaking of festivals, who among us doesn't have fond memories of the small town festivals we attended as children? I still remember the bed races in Richmond, Ohio, the Cadiz Coal Festival, and the Smithfield Apple Festival. I am also happy to report that the Mingo Community Days are returning this year. Although none of these Jefferson County Ohio gatherings are listed at the Festival Links Page (yet) you will surely enjoy the others listed. Check to see if your small hometown festival is represented, and if not -- contact your community leaders to resolve that omission! America Quilts explores the rich history, art, and personal stories of quilt-making in America. The Quilt Channel is your jump station to all the quilting goodies the web has to offer. Theiraim is to be the most comprehensive guide to quilting links anywhere. 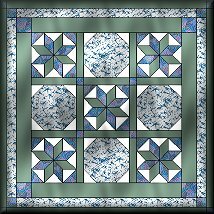 QuiltNet is a gateway to a delightful array of craft-related web pages, covering the worlds of quilting, weaving, sewing. Old Time Radiois your source for the history of nostalgic and old time radio series and news! America as it Was is a virtual tour of the U.S. through vintage postcards. For an additional Americana fix, go to my Art & Music page and browse through my list of favorite NPR and PRI radio shows. And for another 'cross-post': my Ohio & Alumni page has links to various Amish related sites in Ohio. Roadside America is your online guide to offbeat attractions. Scores and scores of wacky attractions and local landmarks for the traveler who absolutely HAS to see things like the world's largest basket, of ears of corn statues six feet tall... The site also includes a feature where you can submit your own additions. Great fun.